High Quality Content by WIKIPEDIA articles! The Volkswagen Santana is a sedan version of the Volkswagen Passat, first introduced in 1981, and also known in North America as the Quantum. (In South America, only the station wagon version was called the Quantum). 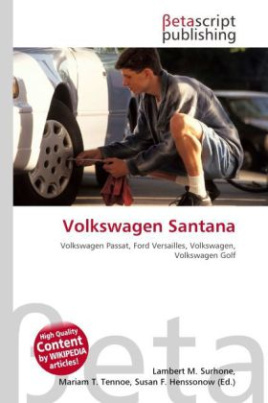 In Europe, the Santana name was dropped in 1986, with the model simply renamed as the Passat. During this time, production of the Santana began in China, with the model available as a sedan and station wagon, which continues today. The Santana was also assembled by Nissan in Japan under license. Similar versions of the Santana have remained in production in Brazil and Argentina. Under the terms of a joint venture with Ford called Autolatina, the car was also sold as the Ford Versailles in Brazil and as the Ford Galaxy in Argentina. This continued until the 1990s.